We enjoy corn in many different forms. 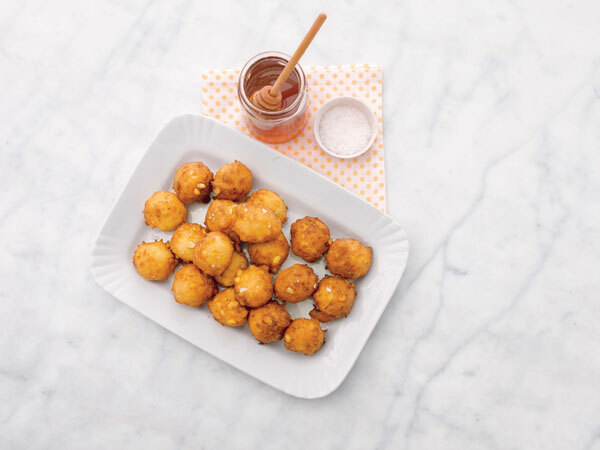 In this episode, Martha first demonstrates Corn Fritters, a sweet and savory treat topped with honey. Next she shows how to make Corn Stock, which can serve as the base for a tasty Summer Corn Chowder — Martha’s version uses potatoes and cream. And finally, a childhood favorite all grown-up: homemade Creamed Corn. Martha uses a spoon to scrape the corn pulp to make creamed corn. It is an essential part of the traditional creamed corn. Try Martha Stewart's corn fritters recipe from the "Corn" episode of Martha Stewart's Cooking School. In a large bowl, stir together flour, cornmeal, sugar, baking powder, 1 ½ teaspoons salt, and cayenne. Add milk and egg to flour mixture and stir together to create a batter. Add corn and fold to combine. Heat 4 inches oil in a large heavy-bottomed pot or Dutch oven over high heat until a deep-fry thermometer reaches 375 degrees. Working in batches, using a small ice cream scoop or two spoons, drop batter by the tablespoon into the oil. Cook, turning occasionally, until cooked through and deep-golden brown, 1 to 2 minutes; adjust heat as needed to keep oil temperature between 350 and 360 degrees. Transfer fritters to a paper-towel-lined baking sheet. Season to taste with salt, and serve immediately with honey.